ทุกวันอังคาร ตั้งแต่เวลา ๑๙.๐๐ น. ถึง ๒๑.๓๐ น.
Venerable Bhikkhuni Tathaaloka Theri was born in Washington, DC in 1968 to environmentally-minded scientist parents. She followed her mother’s example by observing nature for answers and for peace, and her father’s example of inquiry through scientific research and investigation. At age 19, urgently inspired by the sudden death of someone with whom she’d been close, she left university and made her way to Europe and India, entering monastic life as an Anagarika. Later she met her female mentor in Buddhist monastic life in South Korea, Bhikkhuni Elder Myeong Seong Sunim, under whose guidance she trained for 10 years. Venerable Tathaaloka Theri received the “Going Forth” with her bhikkhuni mentor in 1993 and Samaneri precepts in 1995. Returning to the United States in early 1996, she received Bhikkhuni Upasampada with an international gathering of Bhikkhu and Bhikkhuni Sanghas in Los Angeles in 1997, with the late Bhikkhu Ratanasara Sangha Nayaka Thera as her Upajjhaya (preceptor). 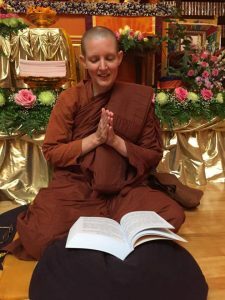 Since then Venerable Tathaaloka Theri has focused on studying and practicing Dhamma-Vinaya and has conducted research in Comparitive Bhikkhuni Vinaya and World Bhikkhuni Sangha History, contributing articles on these subjects. Recognizing the growing number of Theravadin Bhikkhunis and Samaneris in the United States and the true value of coming together in harmony, Venerable Tathaaloka Theri proposed and participated in the founding of the North American Bhikkhuni Association (NABA) in 2005. Several months later, she also participated in founding the Dhammadharini Vihara and the Dhammadharini Support Foundation. In 2009, she received the gift of use of coastal redwood forested land for an off-the-grid women’s monastic hermitage, Aranya Bodhi. She currently resides as the abbess of Dhammadharini Vihara in the Santa Rosa and the Aranya Bodhi Hermitage on the Sonoma Coast in Northern California, where she provides spiritual guidance and monastic training in conjunction with hermitage prioress bhikkhuni Ayya Sobhana. Venerable Tathaaloka Theri is the second Western woman to be designated as Theravadan Bhikkhuni preceptor (Pavattini/Upajjhaya); she also serves as a senior monastic advisor to the Dhammadharini Support Foundation, the Alliance of Bhikkhunis and Sakyadhita USA.